We’re delighted that one of the top music production companies, audio machine, has been very supportive of Create Now for the past two years. Now they’re also sponsoring our new Create Audio program. This 20-week workshop began in August and takes place at our recording studio. 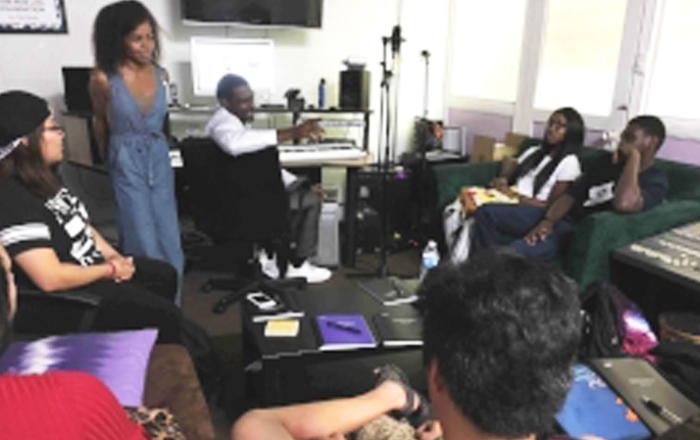 Eight youth, ages 18-22, who have aged out of the foster system are learning how to write, create, record, and produce music. These kids, who are dealing with major challenges, are honing the skills required to have a career in the music industry so they can fulfill their dreams. The workshop is led by head engineer, Michael Evans, Jr. (aka Mic), a long-time apprentice and assistant to Grammy award-winning producer and engineer Neil Pogue (who will be a guest artist). The program is organized and co-taught by entrepreneur, artist and activist Jhamasa Noel Lewis-Adams. She also serves as an advocate for foster youth. Other guest teachers include Cliff Frazier, Gabe Rosales, Debra Wilson, and vocalist Olivia Walker. In addition, Paul Dinletir, Kevin Rix and Steffan Koch from audiomachine will share their experiences as volunteers in the program. The students are learning how to use different tools, make drum patterns, write verses related to hooks, and so much more! We arranged for them to go on a Cultural Journey to the Grammy Museum where the kids had a fantastic time. We’re excited to see these young adults flourish as they build skills that will help them to break into the music industry to pursue their dreams. We really look forward to supporting them on this journey. Create Now is especially grateful to audio machine for making this program possible.